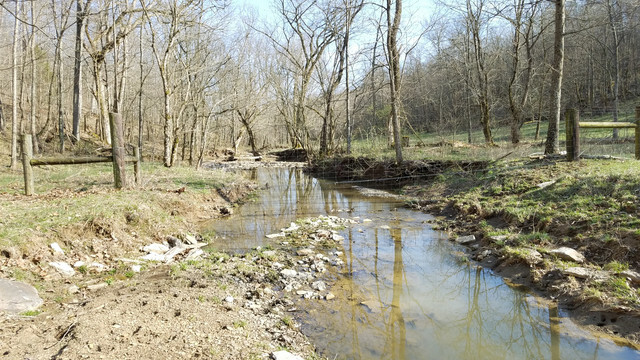 Bovine Breeder ask about the water gap I have on the creek near the back boundary of the farm. 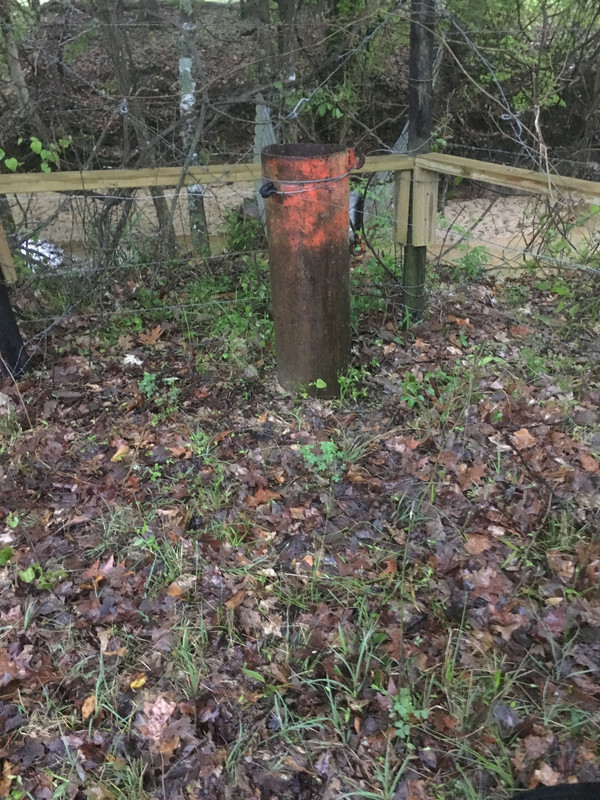 On each side of the creek there are 10 foot long posts driven to refusal or 6 feet deep which ever occurs first. 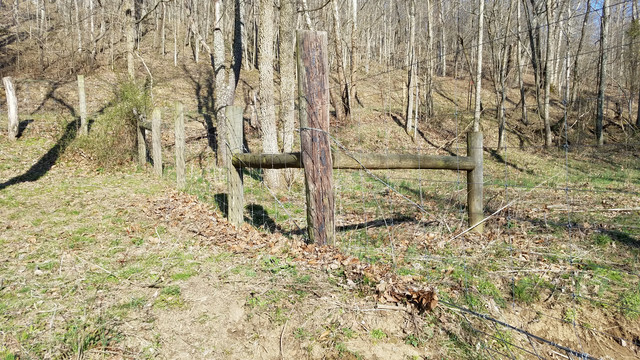 The posts are cut from surplus electric poles. Creosote treated. Each abutment post is braced. The cable runs through the abutment posts and tied off on the outside brace post. 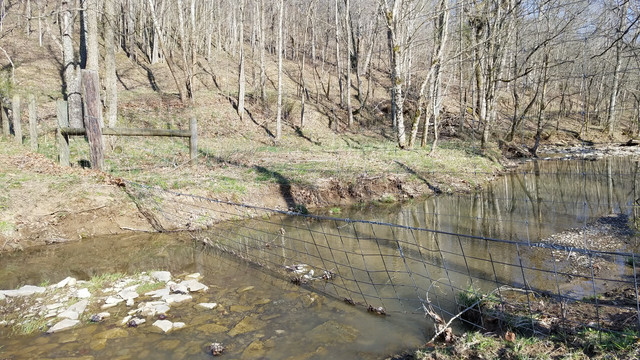 The fence hangs over the creek and a cattle panel swings freely from the cable. Right Post - down 6 feet. Cable Tie Off on brace post. Left Abutment Post. Down 5 feet to refusal and braced down stream and in line. Cattle Panel swings on cable. Got picture of mine under water. I will get a picture tomorrow with the normal flow of the creek. My best water gap washed out during the historic floods we had in February. Ron, my question is, do large limbs and debris not get caught on the cattle panel? It seems it would be better to have it covered with tin or some other solid material to help it shed debris at the bottom. The panel was covered with tin. During the heavy rains of last fall, it got ripped off. Nevertheless, it continues to work. Yes. Debris do get caught in the panel but even with the heavy rains, it has held. I do clean it after every rain event. It doesn't do too bad. I have been planning on putting either tin or a float on. Raven that's pretty much exactly the way we build a gap. Ravens gap wouldn’t last the first good rain here, too many timber products come through along with fine neighbors items like water heaters from miles upstream. The all time best was a cast iron sink that washed up in the pasture. That time the creek went from 10’ wide to a couple hundred feet. 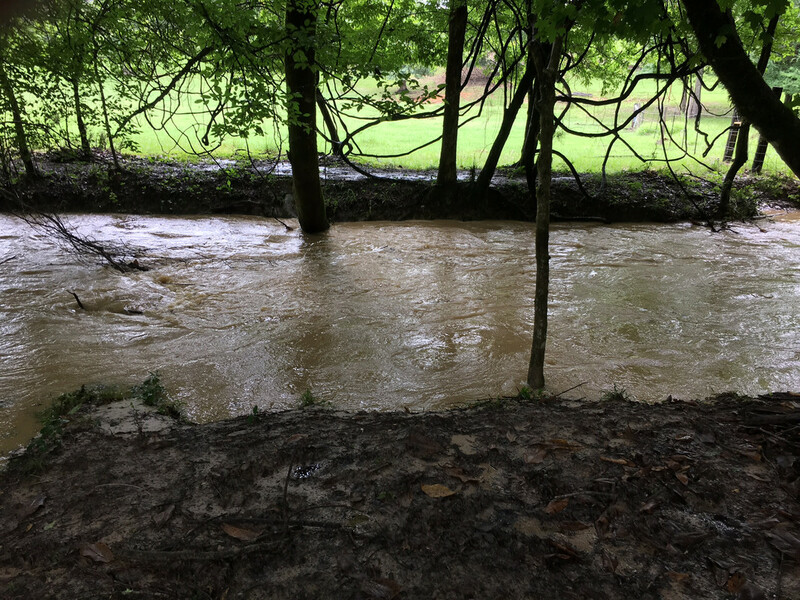 Creek goes from 4” deep to 8 to 10’ in minutes. Mine is 1/4 cable clamped to 8” pipe buried 4’ and concreted in. It’s not real pretty as it has been blown out by frequent biblical rains the last few years. Works like a check valve, as the water flow increases the sheet metal opens up, closing as the water goes down. 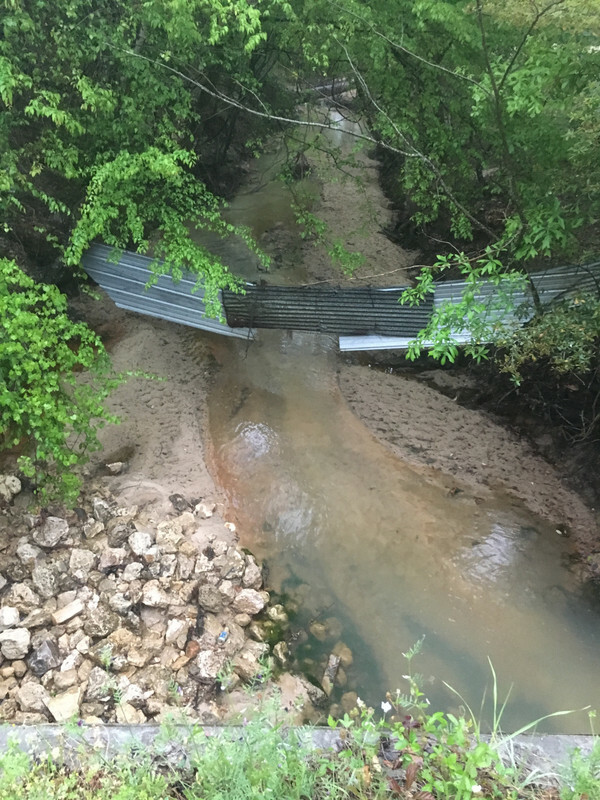 The cables are clamped in the middle of the creek so the gap can blow out when a log comes through. Takes about five to ten minutes to connect the cables and rehang the sheet metal. Pipe,cable and sheet metal type. The picture of the gap is from about 20’ above normal, the water level at times is over the bridge I standing on. The pipe leaning is from about a 24” pine log hit the cables before I came up with the break away design. 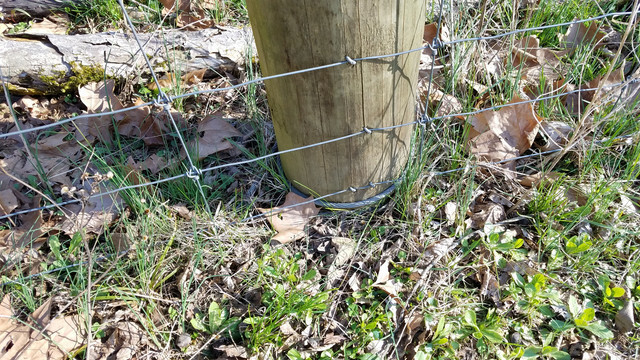 The reason for 1/4” cable is in case of a blow out your golden rod fence stretcher will clamp on to the cable. This allows you to pull the cables back together and reconnect with cable clamps. I am not sugesting you wade out to the middle, but what does your "break away" clamping look like in the middle? I lost an extremely heavy duty gap this spring that was supported with 1/2" cable and it washed clean away. I have no idea where it ended up. 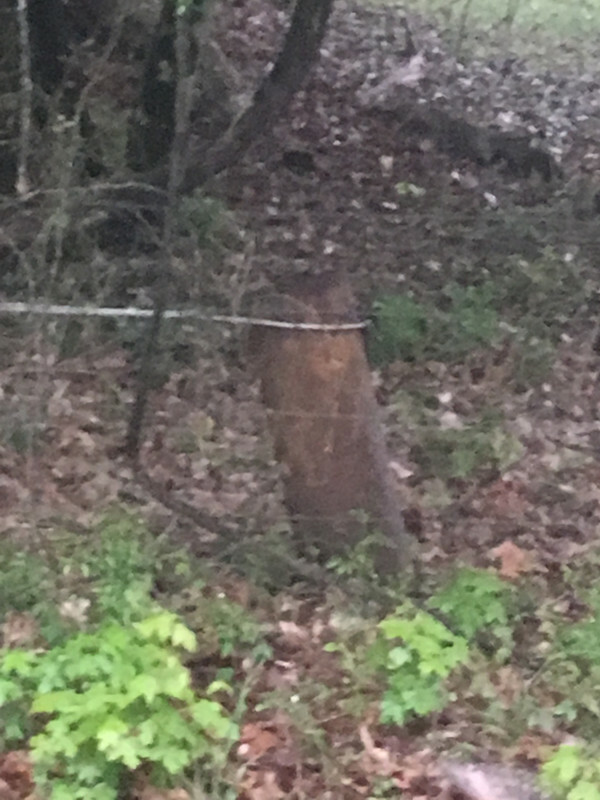 I also lost a section of adjacent fence (twice) that had never washed out before in my entire life. I have considered going with an electric type curtain on each end rather than the regular water gaps. Luckily, my cows in that field know where they are supposed to go and where they are not. Alright let me see if I can explain this where it makes sense. The gap is actually 4 pieces of 1/4” cables that overlap each other about three feet in the middle. Then the two cables are joined with two 1/4 cable clamps snugged up. The cable clamps are sacrificed in a blow out. The sheet metal hangs from the top cable the bottom cable just acts as a stop. The sheet metal is hung on 1/8” cable clamped to the top cable. If the gap blows take your golden rod and clamp back together. As you can see as the water goes down the sheet metal hangs being the end of the world to a bovine. 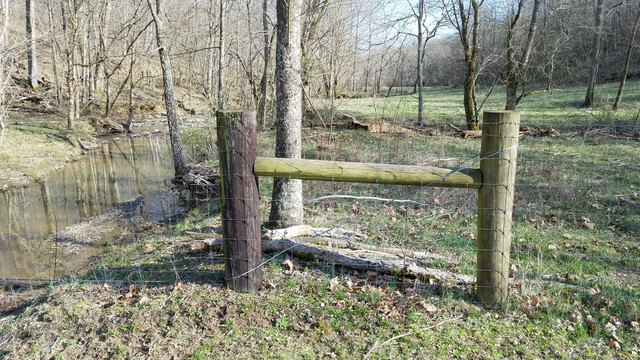 I simplified my life when the water gap became independent of the fence. My challenge was steep sides with a large volume in an inch rain. The watershed feeding my creek is huge within minutes it will go from inches deep to 10’. Hope I explained this well if not let me know.